"My wife and I had a book collection that had outgrown the inexpensive bookcases that had followed us from our small downtown apartment to our new home in Over-The-Rhine. After researching different possibilities on the internet, we contacte﻿d Greg to discuss havin﻿g built-in bookcases installed in our library/office, which is a fairly narrow space where we had little room to spare. "Greg was very friendly and professional in the initial meeting, and provided helpful suggestions for the project while being completely amenable to our initial vision. Once we agreed upon the design, Greg gave a very reasonable price, and provided us with a very workable timeline as to when he could complete the project in his shop and have them installed. 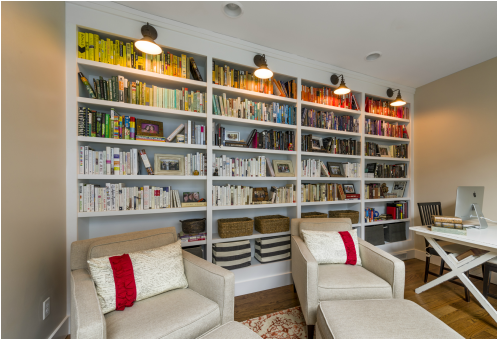 "On the day of the installation, Greg's team was able to quickly transfer the four bookcases up a staircase with some fairly tight turns. Amazingly, there was no damage to the walls, stairs, or bookcases in the process (a complication that I was fully anticipating based on the layout of our home). "The complete installation, including electrical work and painting, was accomplished very quickly. My wife and I couldn't be happier with how everything turned out, and the library has become our favorite room in the house. "Greg's craftsmanship, professionalism, and friendliness throughout the project were extremely refreshing. His artistic vision really sets him apart. We're already considering using him for a future project!"